It’s time to organize peaceful protests (large & small) and candlelight vigils so NO MORE wild horses will die from roundups, be tortured by the helicopters or sold to kill-buyers for delicacy meat abroad. Spread awareness in your communities and let your friends, family and neighbors know they can contact Congress if they don’t like their tax dollars used to fund cruel roundups. Ask Congress to find a way to work WITH the wild indigenous horses to create biodiversity on the land–a win-win for wild horses, livestock, landowners, tourism and energy development on the New Energy Frontier. 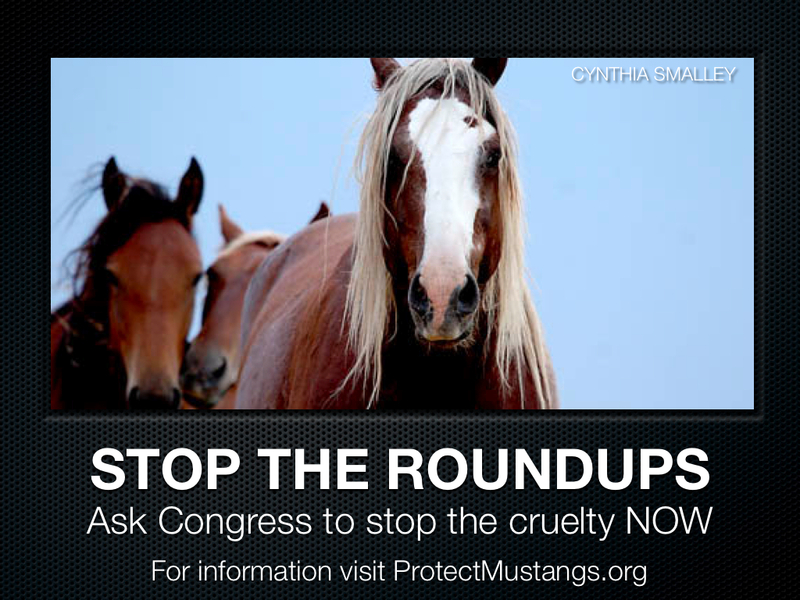 Join us to call for a moratorium on roundups. If you don’t like the cruelty and deaths at roundups contact your senators and congresspeople and request they stop it now. Congress approves funding for roundups. YOUR tax dollars are paying to wipe out America’s wild indigenous horses. Why are empty stock trailers pulling into BLM holding facilities when they are closed on Sunday at sunset? Princeton University researchers are leading an effort to put to pasture the long-held convention of cattle ranching that wild animals compete with cows for food. Two recently published papers — including one in the journal Science — offer the first experimental evidence that allowing cattle to graze on the same land as wild animals can result in healthier, meatier bovines by enhancing the cows’ diet. The findings suggest a new approach to raising cattle that could help spare wildlife from encroaching ranches, and produce more market-ready cows in less time. The reports stem from large-scale studies conducted in Kenya wherein cows shared grazing land with donkeys in one study and, for the other, grazed with a variety of wild herbivorous animals, including zebras, buffalo and elephants. The lead author on both papers was Wilfred Odadi, a postdoctoral research associate in the lab of Dan Rubenstein, the Class of 1877 Professor of Zoology and chair of Princeton’s Department of Ecology and Evolutionary Biology. In August, Rubenstein and Odadi reported in the journalEvolutionary Ecology Research that cattle paired with donkeys gained 60 percent more weight than those left to graze only with other cows. The researchers proposed that the donkeys — which were chosen as tamer stand-ins for zebras and other wild horses — ate the rough upper-portion of grass that cows have difficulty digesting, leaving behind the lush lower vegetation on which cattle thrive. In September, Odadi and his co-authors on the Science paper reported that other grazers, especially zebras, did remove the dead-stem grass layer and that cattle indeed seemed to benefit from sharing land with wild animals. Cows in mixed grazing pastures took in a more nutritious diet and experienced greater daily weight gain — but this effect was limited to the wet season, the length of which can vary by region. Cattle competed with wild species for food in the dry months. Nonetheless, the Princeton studies help counter an enduring perception that wildlife is an inherent threat to the food supply of livestock, Rubenstein explained. These results could prove crucial to preserving animals that are increasingly threatened as the human demand for food drives the expansion of land used to raise cattle. Zebras and wild horses are especially vulnerable to the spread of pastures because of their abundance. “Grazing competition from other animals has been an issue throughout history,” Rubenstein said. The studies are the first to experimentally test and prove hypotheses from the 1960s that equines make grazing land more suitable for bovines, a dynamic known as facilitation, Rubenstein said. Observations of zebras and wildebeests had suggested that the zebras’ ability to digest grass stems exposed the leafy grass wildebeests prefer. Animals in the horse and cattle families both process food through fermentation as microbes in the digestive system break down vegetation. In horse-like animals, this process takes place in an organ located after the stomach that is similar to the human appendix (though humans are not fermenters). For bovines, on the other hand, fermentation happens in the rumen, an organ before the stomach that produces cud, which is regurgitated for the animal to further chew. As a result of these digestive distinctions, Rubenstein said, equines can eat the rough low-quality grass that would linger and fester in a cow’s slower, more complex gut. The bovines in turn enjoy the lush, easily digestible grass underneath the stems. Both Princeton studies showed that the presence of equines resulted in less dry-grass cover and a more nourishing diet for the cows. Although the study in Science matched cattle with other wildlife — including bovines such as buffalo — Odadi and his co-authors largely attributed the removal of the low-quality grass to zebras. What was not expected was just how much the cattle can benefit, Rubenstein said. Rubenstein conducted the experiment reported in Evolutionary Ecology Research on rangeland in northern Kenya with Odadi, who is based at Kenya’s Mpala Research Center — with which Princeton is a partner — and co-author Meha Jain, who earned her bachelor’s degree from Princeton in 2007 and whose senior thesis was the basis of the project. The team chose donkeys as surrogates for zebras, which suffer from food and habitat loss due to cattle operations, particularly the endangered Grévy’s zebra. Because donkeys are tame, the researchers could more easily observe, weigh and record the diet quality and health of the individual animals, Rubenstein said. The researchers constructed six separate grazing areas divided into three high-density and three low-density pastures. Both the high- and low-density areas hosted an all-bovid group of 15 cows; an all-equid group of 10 donkeys; and a mixed group of 15 cows and 10 donkeys, for a total 60 cows and 40 donkeys. The animals grazed seven hours each day. For 12 weeks, the researchers documented the animals’ weight changes and eating habits. In addition, the excrement of tagged cows in each grazing area was analyzed for protein, parasite and digested-grass content. Study co-authors and ecologists Herbert Prins and Sipke Van Wieren of Wageningen University in the Netherlands validated the effectiveness of these measurements. At the end of the experiment, cows that fed alongside donkeys had beefed up by an average of 64 pounds (29 kilograms) per animal in the low-density pasture, and slightly less than 37 pounds (17 kilograms) for the high-density group. In comparison, cattle dining only with their own put on an average of 55 pounds (25 kilograms) per cow with more room to roam and only nearly 28 pounds (12.6 kilograms) in tighter confines. When compared to the weight of the cattle recorded at the experiment’s outset, cows grazing with donkeys gained an average of 60 percent more weight than cows that did not, the authors reported. Moreover, none of the cows in the mixed groups remained at the same weight or lost weight, unlike some of the cows in the bovid-only pastures. Analysis of the protein and grass-remnant content of the cows’ dung showed that the animals consumed a healthier diet when sharing land with donkeys. A notable feature of the study Odadi conducted with Rubenstein is that it provides some understanding of how the other animals respond to grazing with cattle, Odadi said. The donkeys did not exhibit the benefits of intermingling to the extent the researchers observed in cattle. Donkeys grazing with cattle gained only 51 percent more weight than donkeys that did not, and dung analysis showed the donkeys in the mixed groups actually took in a less digestible diet. But the dung of donkeys in the mixed groups also contained lower levels of parasitic worm eggs, possibly due to the cattle taking in some of the parasites during grazing, Rubenstein said. As a result, parasite infection was less debilitating in these donkeys. For the second study, Odadi and his co-authors on the Science report changed the project’s scope to include large, wild herbivores that share the African savanna with cattle: Grévy’s zebras, African buffalos, elands, hartebeests, gazelles, elephants and giraffes. Odadi worked with ecology professor Truman Young of the University of California-Davis; Moses Karachi of Egerton University in Kenya; and Shaukat Abdulrazak, chief executive officer of the National Council for Science and Technology in Kenya. The researchers created nine grazing areas of equal size, each with four cows. The pastures fell into three categories: cows only; plots open to medium-sized herbivores and closed to elephants and giraffes; and plots open to all wild herbivores. Each variety was randomly assigned to three grazing areas. The experiment consisted of two 16-week trials (conducted a year apart) with each trial beginning in the dry season and ending during the wet season. In each trial, the team weighed the cows and examined the animals’ excrement to determine diet quality. In the wet season, cattle that ate with wild herbivores took in a more nutritious diet and experienced greater weight gain than cows that did not, according to the Science report. In the cow-only enclosures, each animal put on roughly a half-pound (0.25 kilograms) each day. In the other pastures, each cow bulked up by three-fourths of a pound (0.35 kilograms) daily. The experiment coincided with 18 weeks of Kenya’s wet season. For that period, daily weight gain translated to 69 pounds (31.5 kilograms) for each animal in the cow-only enclosures, versus 97 pounds (44 kilograms) per cow in the other areas. The dry season and resulting scarcity of grass turned that dynamic on its head, however, as Odadi and his co-authors expected. Cows grazing without other animals gained more than a half-pound per day. Weight gain for cows in the mixed enclosures plummeted to roughly one-third of a pound each day. A future direction of the project may be to determine if adjusting cattle-to-wildlife density based on the season would reduce competition when food is scarce, Odadi said. The Princeton researchers make an important contribution to the study of how to reconcile the demand for grazing land with ecosystem conservation, said Michael Coughenour, a senior research scientist at the Colorado State University Natural Resource Ecology Laboratory. The research not only shows that facilitation between livestock and wildlife is possible, but also suggests the mechanisms — for example, the removal of dry stems — that provide that benefit, he said. Naturally, Coughenour said, many questions remain, such as if the mere presence of many grazers results in more robust plant growth, as existing research has suggested might occur. But the results should nonetheless prompt researchers to investigate the existence of facilitation in other regions and ecosystems, as well as the livestock-to-wildlife densities that make it possible, Coughenour said. For instance, the United States and other temperate-zone countries do not have a distinct wet and dry season. Also, it cannot be assumed that grass in the American West would respond to mixed grazing in the same way as savanna grass, nor that a similar concentration of zebras and American wild horses would benefit cattle in the same way in their respective environments. “These findings add to the dialogue by providing evidence that interactions between wild equids and livestock are not necessarily negative, as would commonly be assumed among ranchers and commercial pastoralists,” Coughenour said. In the Evolutionary Ecology Research paper, Rubenstein, Odadi and Jain delved into how the weight gain they observed in cows grazing with donkeys could translate to economic gain for ranchers by producing cattle that are ready for market sooner. As an example, they imagined a farmer beginning with a cattle herd with an average weight of 660 pounds, or 300 kilograms, that he intends to sell after the animals put on an extra 200 pounds, or 100 kilograms. In their scenario, they first substituted the 10 donkeys in the experiment with 10 more cows to make up a herd of 25 cattle. These cows would take nearly 18 months to reach the target weight of 400 kilograms if the animals packed it on at the rate of roughly 0.2 kilograms, or a half-pound, a day, as many of the cows in the researchers’ single-species pastures did. Replacing 10 cows with donkeys, however, would bring the remaining 15 cows to the preferred weight in about 11 months. The researchers assumed those cows would gain weight at the average of nearly 0.3 kilograms, or 0.66 pounds, a day seen in the mixed-group cows in the experiment. “Time has a cost. If cows grow faster per day, they can get to market sooner and the landowner can preempt the costs of cattle dying from predation or disease as the animal is exposed to the elements for longer periods ,” Rubenstein said. Cows with a few extra kilograms of weight could be a “huge” benefit to ranchers and pastoralists, particularly in Africa, as well as to the preservation of natural lands, said Joshua Ginsberg, senior vice president for the Wildlife Conservation Society’s Global Conservation Program. Ginsberg, who received his Ph.D. from Princeton in 1988, focuses his research on conservation and animal-human interaction. “A few kilograms is a major increase,” Ginsberg said. “If the cattle are managed well, and the markets exist and are used, it would allow for greater income, greater protein and the ability, at least in theory, to reduce cattle-stocking rates because of increased productivity. At the Mpala Research Center, Odadi has presented his findings to local farmers, but understands the difficulty of overturning long-held views about the livestock/wildlife competition. The first study, “Facilitation Between Bovids and Equids on an African Savanna,” was published in Evolutionary Ecology Research in August 2011, and supported by grants from the National Science Foundation, the Keller Family Trust and Wageningen University, the Netherlands. The second study, “African Wild Ungulates Compete With or Facilitate Cattle Depending on Season,” was published in Science on Sept. 23, 2011, and supported by grants from the National Geographic Society, the National Science Foundation, the U.S. Fish and Wildlife Service, and the International Foundation for Science.